With a name that's a deejay's nightmare and music that's a migraine headache to easy-listening fans, the heavy metal act Kick Axe still is one of the bright, promising acts on the rock music scene. Kick Axe will open for Judas Priest next Tuesday at Market Sauare Arena in Indianapolis. Kick Axe is one the wave of Canadian acts, which like Triumph and Rush, have made our northern neighbors one of the heaviest contributors to USA hard driving rock. And it wouldn't be that way if there weren't an eager audience, said one of the members in a phone interview earlier this week. "America's where you want to be for commercial success," explained Victor Langen, bass guitarist for the group. "Canadians in many ways have an inferiority complex." "Ig a group becomes a success in America they suddenly gain notoriety in Canada even if they have performed for years in Canada," Langen noted during a call from Cocoa Beach, Fla., where they were about to play. Kick Axe began its career by playing concerts at rowdy street gang parties in Regina, Sask. The Vancouver based group has come a long way since those rowdy beginnings but maintains its connection with powerful heavy metal sound. "We have certainly played a lot of weird gigs in our time," Langen said. "In Canada you have club circuit and then you have to claw your way to the top in large arenas." "Vices," the group's debut album for CBS Records (distributed by Pasha Records), is filled with five-part harmonic vocal structures that is a mix between jazz, rock and heavy metal. 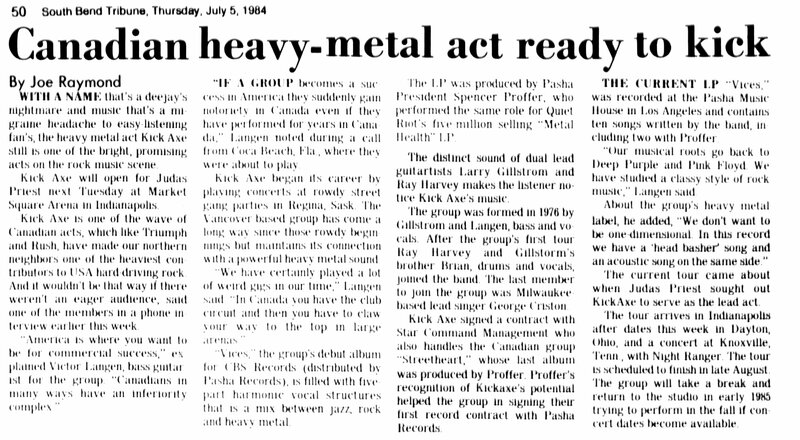 The LP was produced by Pasha President Spencer Proffer, who performed the same role for Quiet Riot's five million selling "Metal Health" LP. The distinct sound of dual lead guitarists Larry Gillstrom and Ray Harvey makes the listener notice Kick Axe's music. The group was formed in 1976 by Gillstrom and Langen, bass and vocals. After the group's first tour Ray Harvey and Gillstrom's brother Brian, drums and vocals, joined the band. The last member to join the group was Milwaukee based lead singer George Criston. Kick Axe signed a contract with Star Command Management who also handles the Canadian group "Streetheart," whose last album was produced by Proffer. Proffer's recognition of Kick Axe's potential helped the group in signing their first record contract with Pasha Records. The current LP "Vices," was recorded at the Pasha Music House in Los Angeles and contains ten songs written by the band, including two with Proffer. "Our musical roots go back to Deep Purple and Pink Floyd. We have studied a classy style of rock music," Langen said. About the group's heavy metal label, he added, "We don't want to be one-dimensional. In this record we have a 'head-basher' song and an acoustic song on the same side." The current tour came about when Judas priest sought out Kick Axe to serve as the lead act. The tour arrives in Indianapolis after dates this week in Dayton, Ohio, and a concert in Knoxville, Tenn., with Night Ranger. The tour is scheduled to finish in late August. The group will take a break and return to the studio in early 1985 trying to perform in the fall if concert dates become available.